In hindsight, Lincoln’s speech was less a moral crusade and more an attempt to keep the senators happy and make Nintendo look like the good guys. As soon as it became clear that the blood-soaked Mega Drive version of Mortal Kombat was vastly outselling the censored SNES one, those guidelines Lincoln spoke of were changed pronto. Mortal Kombat 2 was released fully uncut on Nintendo’s system, with fatalities and gore a-plenty. Night Trap, meanwhile, never did make it to a Nintendo console during Lincoln’s reign, but that was more likely due to technical reasons: the company’s refusal to embrace CD-ROM meant neither the SNES or the N64 would have really been able to handle a game that consisted entirely of video clips. By the time the GameCube launched and Nintendo had a system with adequate storage, the FMV genre was already dead and Night Trap was ancient history. That was then, though. They say you should never say never, and what we have here is a shining example of this. 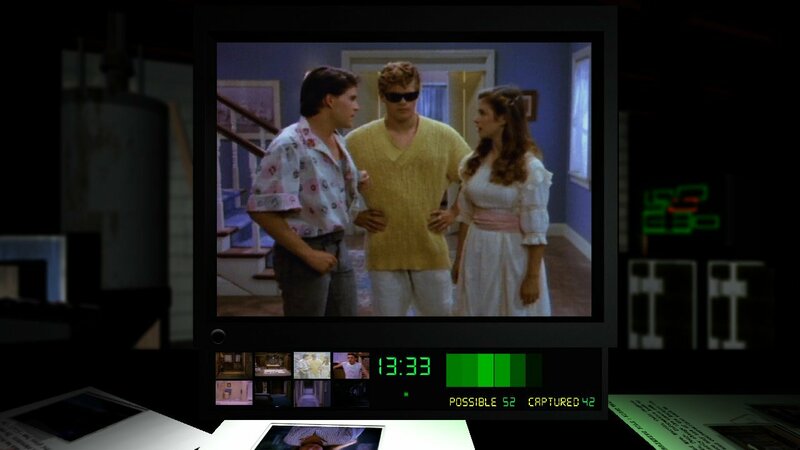 An entire quarter of a century later, despite what Howard Lincoln promised, Night Trap has appeared on a Nintendo system, in a 25th anniversary remaster. If you’re unfamiliar with it, the game puts you in charge of a bank of eight security cameras, each set up in a different room of the Martin household. A bunch of teenagers recently disappeared after a trip to the Martins’, so it’s up to you to figure out what’s going on by using the cameras to keep an eye on a second group spending the night there (one of whom is an undercover agent working for you). It quickly becomes clear that the house is swarming with Augers, a group of shambling, toothless vampires who need to use a special claw tool to extract blood from their victims. It’s up to you to catch the Augers by activating one of the many traps littered around the house. Press the trap button just as an Auger passes over the right spot and they’ll be caught: miss too many of them and it’s game over. The trick, then, is scanning through each room, attempting to catch as many Augers as you can while still trying to eavesdrop on the various conversations going on throughout the house. It’s important you do so, too, because sometimes the residents – suspicious that someone’s onto them – will change the security colour code for the traps and you’ll need to change yours accordingly in order to keep catching the blood-sucking bad guys. 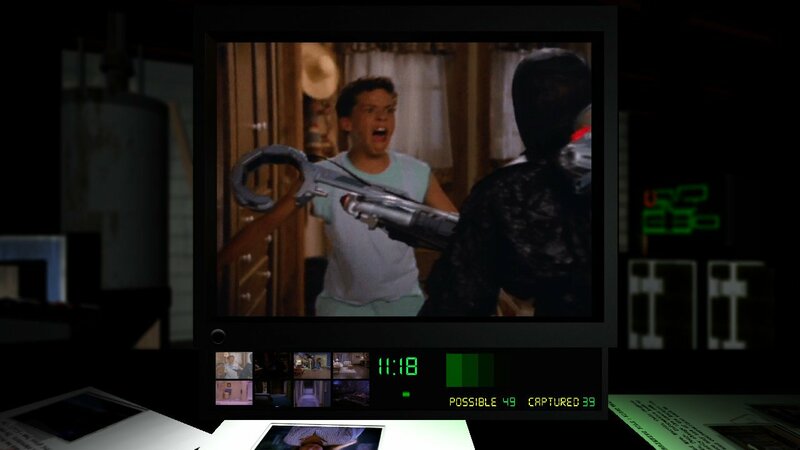 Since it’s essentially just made up of a bunch of video clips, Night Trap is an extremely linear game and a short one at that: a perfect run takes around half an hour. The fun comes in trying to achieve that level of perfection, though, by slowly but surely memorising the sequence of events and learning which dialogue scenes you should watch and which can be ignored. If you prefer your games to be a completely different experience each time you play, then Night Trap certainly isn’t for you. This is about playing the events of one evening over and over, Groundhog Day-style, until you figure out how to handle it flawlessly. There’s a brilliant reason for doing so in this version, but we’ll get to that in a bit. This 25th anniversary edition of Night Trap – originally developed by one-man team Screaming Villains and ported to Switch by Limited Run – delivers by far the best-looking version of the game. At the time it was originally released on Mega CD (and later PC and 3DO), CD-ROM video technology was still in its infancy and the extreme compression meant the video quality was horrendous. Footage was blocky and grainy, the video window was tiny and the frame rate was cut heavily in order to fit everything in. For this version, the developer was given access to the original tapes containing all the footage shot at the time. This meant the game had to be rebuilt almost from scratch, but the result is picture quality that absolutely demolishes the ‘90s versions: the video window is satisfyingly big, the detail is far greater than before and the frame rate has been brought up to movie standard. There are some issues, though. The game over scenes – in which your commander gives you a piece of his mind for messing up – were shot years after the other footage, and so high-quality versions of them don’t exist. As a result, these scenes appear in a tiny window in the corner of the screen, which is disappointing. The original tapes have also suffered some damage over the years, so there’s some visible picture tearing and interference in some scenes near the end – though it could be argued that this just adds to the cheesy ‘80s VHS aesthetic. The Switch port, in particular, has its own quirks not present in the previously released PS4 version. Video can occasionally be a little janky in handheld mode and a couple of the longer scenes – the infamous ‘party’ scene where the actors all ham it up to the official Night Trap theme tune being the most notable example – are noticeably more compressed, presumably to help the Switch handle them a little better. That’s the game itself, then: ultimately, it remains as divisive as it was when it first launched back in 1993. You’re either going to love the way it cleverly uses and interconnects video clips to give the impression you’re genuinely analysing the goings-on in this house, or you’re going to hate its linear gameplay and the fact that every game plays out exactly the same way. What’s less arguable, though, is the quality of everything else you get in this anniversary edition. As well as the remastered version of the game itself, this shiny new Night Trap package also includes a bunch of bonus features. Some are fairly throwaway: the Survival mode randomly arranges clips of Augers in the house and tasks you with catching as many as possible, which should amuse you for a while but is a bit soulless. Far better are the other goodies. Theater mode appears when you beat the game and lets you replay any of the dialogue scenes you stumbled upon, giving you the chance to enjoy them uninterrupted without the need to jump to another room to trap someone. Meanwhile, there are two brilliant documentaries – one recorded in the ‘90s shortly after the congressional hearings and a more recent one shot in 2017 for this new edition – which are well worth a watch. Even better, get a perfect game by capturing all the Augers and you’ll unlock Scene Of The Crime, the unreleased 1986 prototype of Night Trap that was created as a sort of proof-of-concept when the idea was being pitched to toy company Hasbro for the NEMO game system. This is an absolutely incredible addition: for years Night Trap fans had only seen tiny, seconds-long snippets of Scene Of The Crime, so to not only see the full thing but actually be able to play it too is beyond belief. As a game it’s fair to say Night Trap is an acquired taste: on one hand, it has limited interactivity and B-movie acting that’s cheesier than Wallace and Gromit’s fridge, but on the other, its inventive use of FMV and unique trapping mechanic has earned it a cult following. There’s no denying the quality of the surrounding package, though, and regardless of your thoughts on Night Trap itself, the addition of a pair of lengthy documentaries and a playable version of its fabled prototype make it fascinating for gaming historians. If you have no interest in retro gaming and aren’t willing to look past its limitations, Night Trap’s repetitive nature is likely to confuse and irritate you. Come at it with an open mind and an enthusiasm to discover (or relive) the brief period when we all foolishly thought FMV was the future, and you’ll find a charmingly silly game accompanied by a host of wonderful features that elevate it to more than just a remaster, but a digital museum piece commemorating a unique time in gaming history. Hmm, giving a notoriously awful game a 7 seems kinda weird to me. I get this remaster is done well with a couple extra features included, but at the end of the day it’s still the same bad game. The novelty aspect of playing one of the worst games ever created wears off after only a few minutes. I’m sorry, but a game review should simply rate the game. A perceived potential nostalgia factor should not give the game a pass. Why not rate the game, and then let the readers add their own nostalgia-filter. I played this years ago, and it is an utterly useless game. Falling into the trap again, of supposing the reviewer is not a human and must demonstrate impartiality. @DreamerDC As I say in my review, I don't believe the game is "notoriously awful". It's retrospectively gained a reputation and these days can be seen in a handful of "worst game ever" lists, but suggestions that it's objectively terrible are just untrue. I dare say a lot of people talking about how bad the game is haven't actually played it and are just going along with the generally accepted canon of bad games. Despite its limitations there are some clever ideas in here and the fact that I owned it on the Mega CD back in the day and still find this new version fun to play 25 years later means there are clearly some other people out there who will appreciate it: it can't be just me or this version would never have been made in the first place. If it didn't have the extras I would've probably given it a 5 because it's so divisive and love-it-or-hate-it, but the attention and care given to its extra features make it also worth a look for people who may not necessarily like the game but still have an interest in its place in gaming history. Hope that helps clarify things. This is as good as it gets for Night Trap. A true deluxe edition. If you were ever a fan of this super cheesy Sega CD game, it's definitely worth picking up for the Switch. It's worth it just for the documentaries, they're great. I'm actually going to try to beat this game for the first time ever. It's so bad it's good. I bought Night Trap when it first came out on the Mega CD. It's certainly an acquired taste, but I always found it fun. I do wish this port was a little better though - the video quality is pretty compressed, it skips frames a lot, and some difficulty options would be welcome. The game was always tough, requiring lots of memorisation, so an easier mode (where you can miss more Augers) would have been nice. @scully1888 Fine, i strongly disagree with this review, but that’s fine. I too played this game 20’ish years ago, but i think it was a terrible game back then, and i know it definitely didn’t age well today. I’m sure people have some kind of nostalgia for awful games like this, but i don’t think it warrants a 7 (or even a 5). A couple good ideas, in an otherwise horrible game (in every way possible), does not make for a good game. @DreamerDC Well, as you can see by the comments above you, not everyone thinks it's a "horrible game in every way possible", so I'm happy with my score. You're completely within your rights to disagree: that's how opinions work. In all seriousness though, Chris's review is fair. I'm glad he's back on the site. I get where the reviewers coming from. The score is for the package, not just the game. In the review he points out the issues of the game and that it is not foe everyone. The only people who will be misled are those people who typically just read the score and not the review, and that's their fault. And I think mtacritic averages are a terrible way to judge a game for those concerned it bumps up the score. For comparison, I collect Arrow blu rays, whether horror or arty fare. And some of the films can be quite poor. However the blu's become must-haves due to the quality of the extras, documentaries and historical artifacts. And by including extras in the standard release, Limited Run are acknowledging the games faults, yet historical significance. I never thought I'd see the day where this game received a good score. Night Trap was the first game I bought for my Mega CD back in the day and boy did I regret it.Of course it's not all bad,I eventually took it back and swapped it for Ground Zero Texas which was awesome! @Wazeddie22 Ah, those were the good days! I admit, the biggest reason I’m getting this on the Switch is to actually have this notorious game on a Nintendo platform, yeah. I’m waiting for my copy from Limited Run Games. I love night trap, but it's an awful game and pretty awful package. The survival mode is probably the worst thing I've ever played, the fact you can't pause, rewind or fast forward the documentaries is really annoying, and that one of the documentaries is so cheap it has background noises over the top of people talking. The fact you have to finish the game to unlock most of the extra content too. Even playing it through with a guide is pretty painful. The Mad Dog collection for Wii was well executed. Regarding the review score... if it's not a 9 or a 10 it's a bad game, so I don't understand why people are complaining, saying it got a good score, when in reality it didn't. A 7?! Are you kidding me 😂... not only is this one of the worst games ever made, it’s also the worst port of this remaster with tons of bugs and compression issues. Really? The Switch can't handle the videos and they don't always run smoothly? Maybe I'll wait for the Xbox One release then. If it has to be digital I prefer it the cheapest possible. Really great review! I don't plan on getting this game but now I kinda want to when it's on sale out of curiosity. You're becoming my new favorite reviewer so I hope you'll do a lot more here in Nintendo Life. Night trap as a game has to be viewed in a slightly complex perspective. As a video game offering the concept was innovative and fresher than what was out there. The gameplay style was very linear but the overall package ended up creating a campy video game version of a crappy B Movie that becomes more cult like than revered. The hearings only added to the mystique surrounding the games release. In addition you have to realize that game release information was not freely available and only obtained through the publisher, game magazines or word of mouth. The news items only helped publicity for this game. I had never played this game before this weekend, and I absolutely agree with giving it a 7. One thing that I think should be pointed out is that the remaster gives you the option to use video previews at the bottom rather than still images (turned off by default). Without the video previews, checking the security cameras becomes a rote, soulless exercise of trial, error and memorization. But when you turn this option on the game becomes MUCH more playable, giving you the feel that you are actually interacting with a living, breathing game world, which you can observe and react to in real time. In my opinion, Night Trap, in its original form, WAS a bad game, and the remaster actually makes it a good one. If you're just not into the gameplay style, then there's nothing Night Trap can do for you, that doesn't mean you can't still acknowledge when that style is done well, or done poorly. As it stands, I think Night Trap on Switch is actually a great mobile game, like some of the better puzzlers, albeit losing replayability once you have everything memorized. But playing a perfect game won't be too easy and it's going to take me a while. This remaster turns Night Trap into the game it was always trying to be, and it turns out that it has some good ideas. A score of 7 is absolutely warranted. It will be interesting to see how many copies actually sell considering it seems to be hated by most.The idea was original and it hadnt been done before on a console but it was such a bad game.If they bring out the Ground Zero Texas and Sewer shark then I'd be interested! And if they are going to bring Mega CD games to Switch...Lunar anyone?? Meh. At least now you don't need to rewind or forward the VHS. Bought this instantly and also have a physical edition coming. A lot is nostalgia talking, but I love this game even if it's overall quality is questionable. I find it incredibly fun, goofy, and enjoyable. Although I don't get a lot of the negative reactions to the review itself. A review is a personal opinion, and everyone is allowed to have one. Its fine to disagree, but its not fine to insult the reviewer. His opinion doesn't invalidate yours, and vice versa. @BoilerBroJoe I'm glad you pointed that out about the motion in the camera select options during the game. Makes it easier for newcomers and is optional for veterans. Its a nice touch. @flapjack-ashley a couple of different opinions but no one insulted the reviewer. @Bondi_Surfer That is incorrect though. There is no objective way of rating a game. There is no way to objectively rate art, for example Black Square by Malevich. Objectively speaking, it's a black square. But it is rating as a very important piece because of it's time and ideas. Same here. It does and should get bonus points, because it is a time-piece. It doesn't get high grades, cause it's a piece of a bad time, but it gets decent grades as a museum exibition (although I would argue it should cost less as a museum piece). discover (or relive) the brief period when we all foolishly thought FMV was the future. I remember Resident Evil 2 on N64 had all the FMV's of the two disc Playstation version, so my guess is Night Trap would have been possible on a Nintendo console as early as the N64. @Misfit410 I want Phantasmagoria on Switch...A much better FMV game. Dunno if the original tapes still exist though (imagine a director's cut with more footage). If they could remake the awful CGI it would be great. I love the full uncut feature of this but my favourite digital pictures game was Texas ground zero! Ground Zero Texas and Sewer shark, absolutely! FMV done way, way better. As for night trap, I owned it many years ago, I have zero interest in this one. How about the whole Working Designs catalog from the SEGA CD! I would prefer anything from them over this. "Nighttrap will never be on a Nintendo console" -Howard Lincoln to congress. I'll play it again sometime when it's very cheap. Nothing I'm ready to jump back into at the moment with so many games in the backlog and upcoming. I had way more fun with Sherlock Holmes than this one on the SEGA CD. Why would anybody waste money on this? It doesn't even seem to the tip the "so bad it's good" scale. This game makes me want some of the other Sega CD "classics" ported over to Switch with HD treatment. Ground Zero Texas, Sewer Shark, Tomcat Alley, Prize Fighter, and Road Avenger would all be dope. I'm not spending money to get this game! This would have been a 3 or 4 out of 10 for me back when it was originally released. There is no possible way this has gotten better. This game belongs in a museum and should stick that way. @Bondi_Surfer The thing is that nostalgia is everything with this release. That's the whole point of the game today, so it's fair to review it for what it's trying to do with this release. I'm holding out for 3DO games to get ported. There are so many good games from the SEGA CD and this is the one game they bring back? I've always regretted (well, sort of) not getting the chance to play this on my Sega CD, and hearing about the special features makes me more intrigued. Also reading the comments where people are like "it's a terrible game and the reviewer is a terrible person for not giving it a terrible score" make me want to finally try it even more. Fingers crossed for Sewer Shark on my Switch! Man... that game was awful. Until you finally figured out how to play it and made it to the end and it turned out to be secretly amazing. I'm kind of hoping that's what Night Trap is like. @scully1888 Are you the same Chris Scullion that used to work on ONM? I was so upset when it shut down and they cancelled my subscription. I enjoyed the game on my Sega cd, enjoying it again on my PS4 and just had to have it on Switch, a Nintendo system and enjoying it again!! It deserves some attention and consideration in gaming history. And folks, there are many far worse games out there!! I own the Sega CD version though I've never played it so I'm looking forward to the physical release from Limited Run. I'm not expecting a good game but the game has it's place in history. @nessisonett the very same one! What's that saying about polishing a turd? CD titles from this era have aged poorly... just fire up Sewer Shark again sometime. Still, the gaming equivalent of a cheesy B movie. Hard pass, but I respect gaming historians will love it. I actually liked all of the corny FMV games I owned (still do, just with no cases or console to play them on) on my Sega-CD/PSX from 1993-1998. I want an remastered version of Braindead 13 and all of the Taito (Time Gal, Ninja Hayate, and Road Avenger) arcade FMV games. @TurboTEF would love to see a remastered Road Avenger!! Wouldn’t mind Time Gal or Ground Zero Texas either!! The conclusion should read "if you have no interest in FMV gaming"
Many (most?) of us despised FMV games in their heyday. The only two you'd ever see me pick up again are Dragon's Lair and Space Ace, and even then I'd be annoyed. I’m really looking forward to playing this with my Aunt since we love watching cheesy movies together. The game looks pretty fun to me but I get that everyone has an opinion. As someone who has owned the Sega CD version of this game, I don't think you could ever get me drunk enough to give this game a 7 or anything even close to that. It is a novelty game but it is also an awful game, probably one of the worst I have ever played. @scully1888 This version made it purely on the basis of how campy Night Trap has become. It isn't a popularity out of quality, it is the same kind of popularity that the CDI Zelda games have had. Sure, they are notoriously awful, but people love to watch it on youtube because it is a great thing to laugh at. Are there some people who actually like the games? I am sure there is, but of course there is always some people who seem to love things that are notoriously awful. @scully1888 You are the kind of guy who would give a re-release of Hotel Mario a high score for being "so bad it's good." @nab1 Has it gone that far? @Quarth It certainly feels like it sometimes. @JayJ Night Trap is in no way comparable to the CD-i Zelda games or Hotel Mario, which are all dreadful. It may blow your mind, but there are indeed people out there – as evidenced by some of the comments above – who enjoy this game and have fond memories of it. The "so bad it's good" thing is overused in my opinion: yes, it's heavy on the cheese, but I had fun with it back in the day and I had fun with it again when playing the Switch version. I'm not really sure if you expect me to give a game a lower score, even though I liked it, just to satisfy the people who want to continue the over-the-top "one of the worst games ever" narrative. Never had a SegaCD and I always wanted to play the game due to the controversy it sparked back in the day. I'm one of those that was excited to see this getting added to Switch. Didn't live up to the violence congress and others portrayed it as. But, I have to admit, the cheesy-ness of it makes it great! I've probably put almost 30 hours into it over the weekend, trying to unlock all the video galleries and getting 100%. Those complaining about the score with their argument only being "the game is awful, worst game ever made" ... really need to stop taking angry video game nerd and other youtube reviewers words as final and absolute to everything. The game really does have charm and the work put into this 25th anniversary well makes up for the asking price. Waaaahhh some goon on YouTube said this game is bad, how dare you give it a reasonable, well thought out review, you probably copied it from IGN too. This game is garbage and it doesn't matter that I've never played it. Waaaahhh! To those newer millennials who wants to know what a VHS quality movie looks like, this game is just that. A 7? Seriously? I still regret having spent my money on that disc back in 93! Correction: Maybe a lot of other people thought FMV and "interactive video" games were the future, but even at the time I knew they were crap, which is why Nintendo was absolutely right to forego CD technology at the time. This game is a shining example of why these types of games just don't work. The bad acting, the linear gameplay and the poor quality of the entire presentation makes E.T. on the Atari 2600 look like a masterpiece in comparison. This remaster might be the best version of the game today, but it doesn't really matter how well you polish a turd, now does it? @Wazeddie22 would love to see ground zero Texas remastered!! @PixelStef yea Mad Dog would be great! I have that Wii collection along with the dragons lair trilogy!! Always fun to read one of Scully1888's reviews. Firstly because they're so well done and secondly for the comments over the award of the score! Bad game or not, I do respect they made it a reasonable price. I was expecting it to be £15+ but at around the £10 mark, its somewhat a decent entry to fill the curious mind, even better when they do the first discount for it. @scully1888 seems like a very vaild reason for a seven to me. 7/10 is ridiculous, the meat of the actual game is surely the most important thing. And lets face it, its garbage. @scully1888 I don't think Hotel Mario on the CDi really deserves the criticism it gets either... the FMV maybe, but not the game. Just thought it was funny that by throwing that game under the bus you are supporting the logic you are opposing. @scully1888 Hey this is your review and you are entitled to your opinion, I just think the game is ridiculous is all. This game is an interesting bit of gaming history but I doubt I'd actually want to play it. I was/am tempted to, for the lawls. But once the gimmick wore off - which I expect would take all of 12 minutes - I'd lose interest. Playing this on your own is zero fun. However myself and a friend played this together last night and spent about three hours on it before we knew it. We had an absolute blast. He took control and I was making handwritten notes of where and when the baddies appeared. Honestly it was a cracking two player experience. Yes you have to keep replaying the same scenes but improving your speed of moving room to room and setting the traps is great fun. Get some beers and some mates- get a pen and paper old school style and have a bit of fun. We were in hysterics at the acting. After three hours we were only about half way through- about the 16 minute point. The only reason we stopped was that it was about 1 am. I agree with the review entirely- 10 quid well spent. @hcfwesker see above- totally agree with you. It’s a seriously entertaining game. Nope. A whole lot of nope. Just to be sure... nope. @Alpha008 When people start to compare Night Trap to Super Mario, it is time to admit when they are going too far. Meh, i'll stick to the VHS version. Will be waiting till the definite 4K remaster, which us fans have been crying out for a long time now. Thanks for speaking of your experience with this game. Looking at all the comments on NL, I thought it was the video game equivalent of the film The Room, which I watched to confirm how bad it was. It makes you wonder if it is became notoriously bad on its own or if the devs created a buzz on purpose to re-release it. @Rhaoulos Without trying to sound flippant, the Rime review has nothing to do with me. I didn't write it, so I can't comment on the thinking behind its score. Nintendo Life isn't some big hivemind, it's made up of different reviewers with their own styles. @Wazeddie22 I am (fashionably) late with this, but, YES. If they bring anything Lunar (sans Dragon Song) over to the Switch, I will eat a raw onion. That is how committed I am to the series. I do like Night Trap’s history, dopey as the game is. Sometimes I’ll unashamedly take a bite out of 80s/early 90s cheese, please and thank you! My takeaway from all of this is that, as long they’re available as a limited physical release, people in 2018 will buy the entire Make My Video series.